In the very north of Luxembourg's Oesling region, in the commune of Kiischpelt, lies a small hamlet by the name of Lellingen. And while this small village ressembles most other villages in Luxembourg, there is more to it than meets the eye. 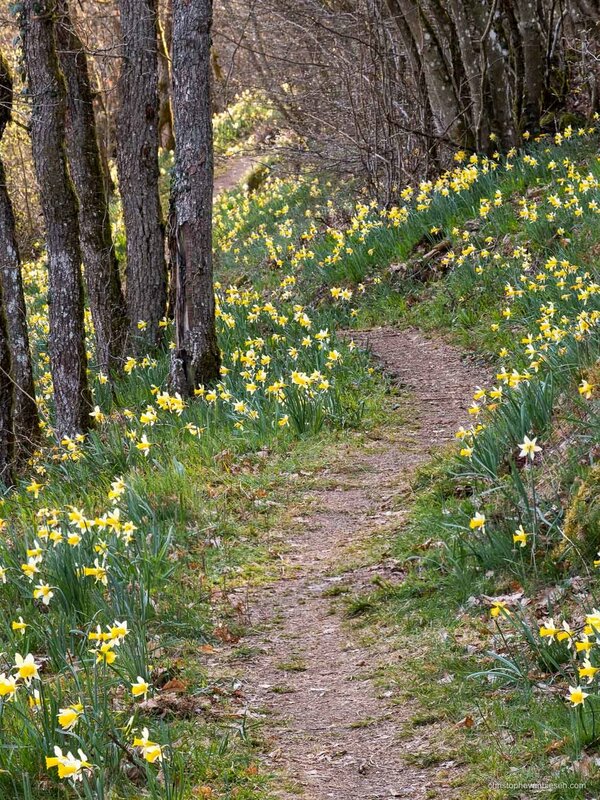 Every spring the forest of Lellingen bears witness to a sea of daffodils. The yellow flowers cover vast parts of the forest and attract many visitors. Where are the daffodils of Lellingen? Finding the small forest that harbours the daffodils is very easy. Once you arrive in Lellingen, park your car in the village or on the outskirts of the forest to the north of the hamlet. From there you will have to follow the Via Botanica, which is a 7.5 km hike. You will start to see the first daffodils after the first 1.5 km or so. Following the path is thankfully very easy, since it is marked very clearly by signs with a daffodil which you'll encounter all along the hike. When you are visiting the Via Botanica please be careful not to walk on the daffodils so that other people may enjoy them too. 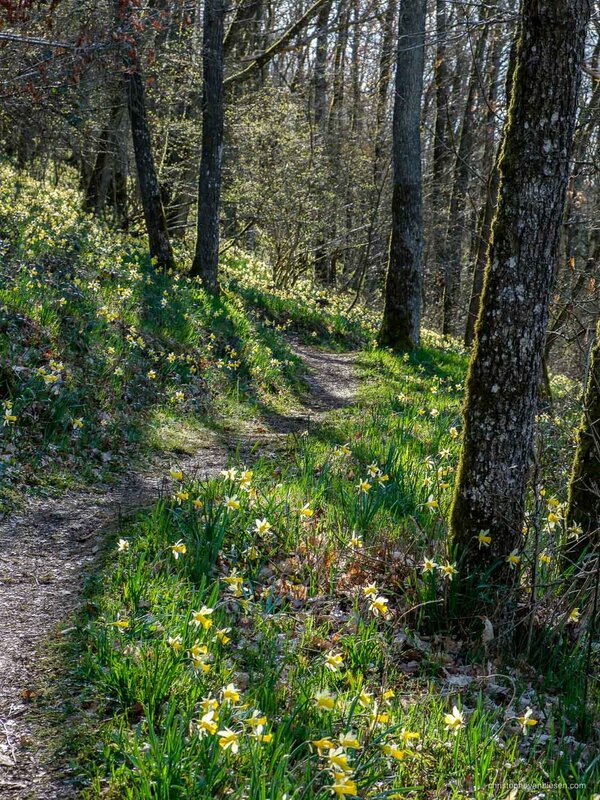 Please also stay on the path, do not wander off into the forest, since the daffodils will not grow the year after where the ground has been trampled. 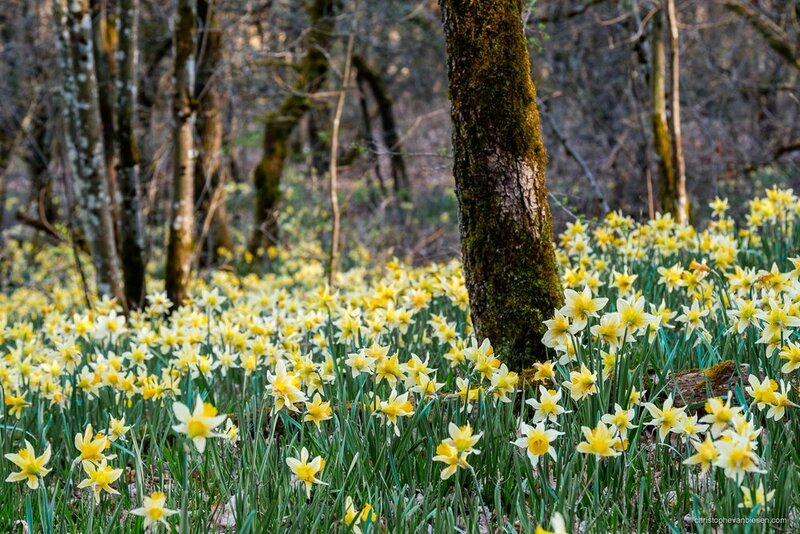 While many come to Lellingen to simply witness the sea of daffodils, some will come there to capture the forest with their camera. What lenses and camera gear should you bring? I recommend using a standard zoom for most pictures, although a telephoto lens is also very useful to zoom in and compress the landscape. I used my Fujifilm 18-55mm lens as well as the 55-200mm lens on the Fujifilm X-T2 and X-T20 for my trip to the woodlands of Lellingen. You should also bring a tripod since it can be quite dark inside the forest, which will force you to use a relatively slow shutter speed most of the time. For more information, check out the complete list of all my photography gear. The forest of Lellingen is quite busy, with lots of small undergrowth and countless branches. This makes it very challenging to find interesting compositions. And while the sheer abundance of daffodils is very pleasing to the naked eye, it makes matters very difficult to isolate a clear subject. Woodland photography is always challenging, but Luxembourg's logging industry adds another layer of complexity. Of course, creating macro shots of the flowers is a very good option, but as a landscape photographer I like to create pictures that show as much as possible of a certain place. I want to capture the essence of a place, and by extension transmit the feeling I had in that place to the viewer. To increase the difficulty even further, coming to the forest on week-ends will let you face countless other visitors. This makes navigating the narrow path and making pictures even more complicated, especially if you are using a tripod. When is the best time to visit the via botanica? 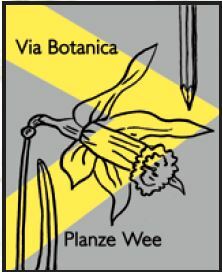 The flowers of the Via Botanica can be a bit unpredictable and blooming will depend on current temperatures. 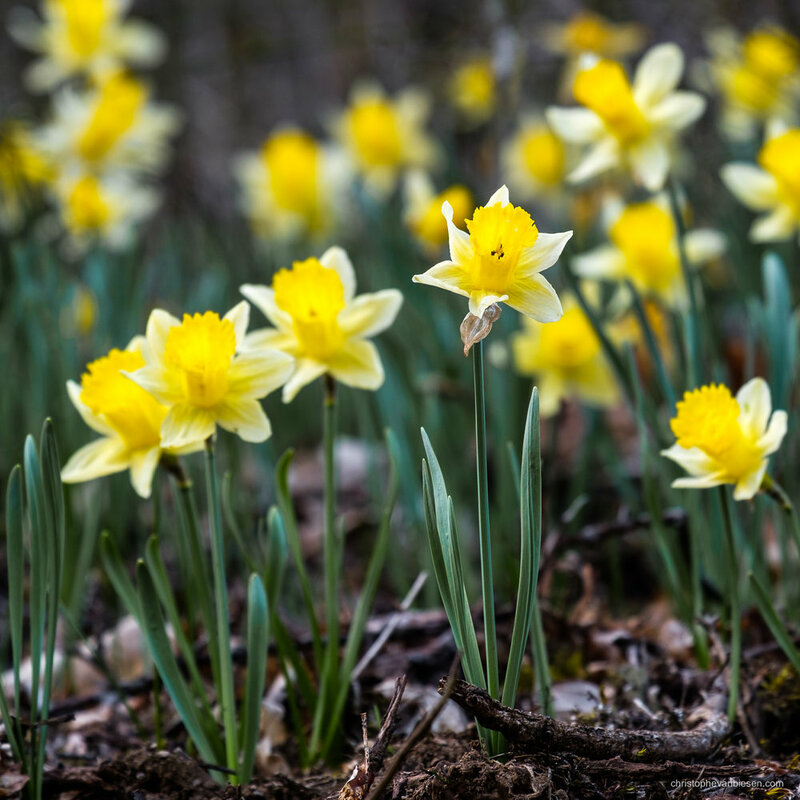 The daffodils usually come out in early April and can last until the end of the month. If you wish to avoid the crowds avoid week-ends and come during the week. Visiting just after sunrise will not only provide some of the best light to photograph the daffodils, it will also allow you to avoid the crowds that usually come here during the day and for sunset. Even if you go back home without any images of the daffodils, hiking the Via Botanica is still a very enjoyable experience. If you live in Luxembourg or find yourself in the Grand-Duchy during spring you should most definitely come and have a look at this spectacle of nature. If you liked this article, have a look at some more of my pictures made in the Grand-Duchy of Luxembourg. All of the above pictures are available as limited edition fine art prints. The images are also available for web and print licensing. Spring is always a very exciting season for photography. Fine art landscape photographer Christophe Van Biesen shows you some of Luxembourg's most stunning spring views through his images. Christmas in Luxembourg is a colourful and wondrous time of the year. Discover the city's Christmas market through pictures made by cityscape photographer Christophe Van Biesen. Luxembourg's numerous forests become a sea of colours during autumn. Discover the Grand-Duchy and its capital during fall through the pictures of fine art landscape photographer Christophe Van Biesen.